There we are, finally. The corps as it was at the Battle of Fuentes de Oñoro. There are around 375 standing figures, 11 mounted regimental colonels, 8 cavalry figures, 3 cannon, and 11 mounted command figures. The ratio is just over 40 men to 1 figure , thus representing over 17,000 soldiers. They represent 34 infantry battalions, a cavalry brigade and 3 divisional batteries. The corps takes up 18"x30" on the terrain. Maréchal Massena, followed by le général Louis Henri Loison with their ADC's. Hi there, I must say, that's a very impressive bit of work there. The army looks good, and you've looked at the history, which is more than I've done recently. An inspiring sight - what next? Well done. I like the historical tact you've used to organize your forces and do remember you making a similar suggestion for mine. Are there any particular references you find helpful in planning out a unit's org strucutre? 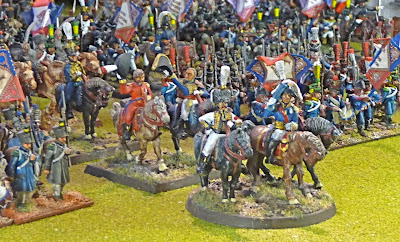 I am considering doing Austrians next 1809, but am waiting to have a look at the Victrix, alos learning how to paint white. I am also working on a transient basing method with sabots to get some RtE units, ie. 24-36 figures at a time. The structure comes from the Osprey Campaign book, this one on Fuentes. Yep, thats a nice collection and well organised along correct historical lines. Congratulations! Do you use them for Lasalle? Both Lasalle and FoB. the only other game I am planning to play is RtoE and I am playing around with some basing concepts now.